Saint Sylvester was born in Rome around the year 250. At a young age, he was put under the care of a priest to be formed in the practice of religion and sacred literature. He enjoyed providing shelter to Christians passing through the city, and would take them with him, wash their feet, serve them at table and give them all the care the needed in the name of Christ. One of the Christians that Sylvester hosted was Timothy of Antioch, an illustrious confessor of the faith. When he arrived in Rome, no one dared to receive him, but Sylvester considered it an honor. For a year, Timothy preached the gospel Jesus Christ with great zeal, while Sylvester selflessly shared his own home. After Timothy died as a martyr, Sylvester buried his remains, but was quickly accused of having hidden the martyr’s treasures, and the governor had him imprisoned. After the governor one day swallowed a fish bone and died, the guards' hearts were softened, and they set the brave young man free. Sylvester’s courageous acts became known to Pope Melchiades, who elevated him to the diaconate. Under the tyranny of Diocletian, the persecution of Christians grew worse while Sylvester was still a young priest. Most Christians that went abroad were put to the test of offering sacrifice, with the alternative of apostasy or death. During this difficult time, Sylvester strengthened the confessors and martyrs, and God preserved his life from many dangers. 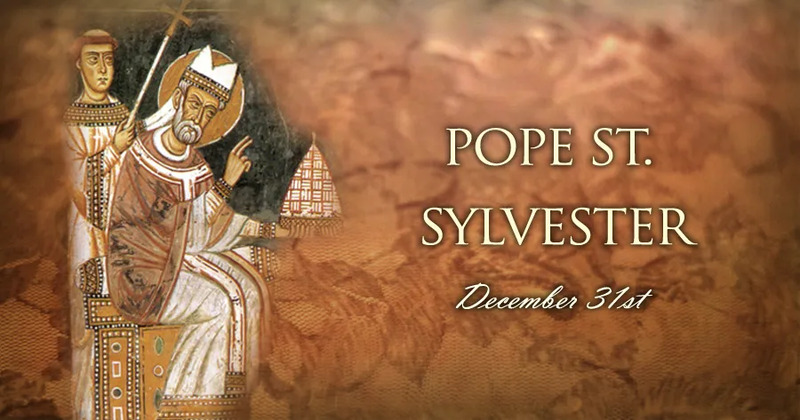 Sylvester became Pope in 314, after Pope Mechiades died, and reigned until 335. He is remembered in particular for the Council of Nicea, the Baptism of Constantine, and the triumph of the Church. A memorable story from Sylvester’s pontificate involved Constantine, who was attacked by leprosy. He was still a pagan at the time, and unconcerned for the Christians, whose doctrine was entirely unknown to him. One night Saint Peter and Saint Paul appeared to him and commanded him to call for Pope Sylvester, who would cure him by giving him Baptism. He obeyed, and the Pope baptized him, with which came Constantine’s conversion. Even though some facts about Pope Sylvester are unknown, his feast day is celebrated on December 31 in memory of his death in 335.